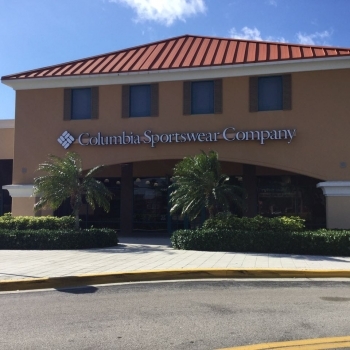 Now that the Columbia Sportswear Factory Store is open in The Palm Beach Outlets, you can enjoy our finest outdoor gear whenever adventure calls. Located midway between Miami and Port St. Lucie, The Palm Beach Outlets are surrounded by the fresh waters of Lake Mangonia, Clear Lake, and the salty sand and warm water of the Atlantic Ocean. A popular vacation destination, the population triples during holiday seasons. Pack light – you can pick up whatever you need at Columbia to fully enjoy your Palm Beach vacation. Columbia has been creating innovative apparel, footwear, accessories and equipment for outdoor enthusiasts since 1938. Columbia has become a leading global brand by channeling the company’s passion for the outdoors and innovative spirit into technologies and performance products that keep people warm, dry, cool and protected year-round.